I can’t stand clutter. It’s funny because John, my fiance, is a bit of a hoarder. He calls himself a “collector”. Thankfully, we’ve been able to meet in the middle. He’s still able to enjoy his collectibles and I’m able to live in a clean, organized home. It took some work to get to that point though! He’s seen why having too much stuff can be a detriment and we’ve compromised on a few things. Are you ready to organize your home? It all starts with decluttering! 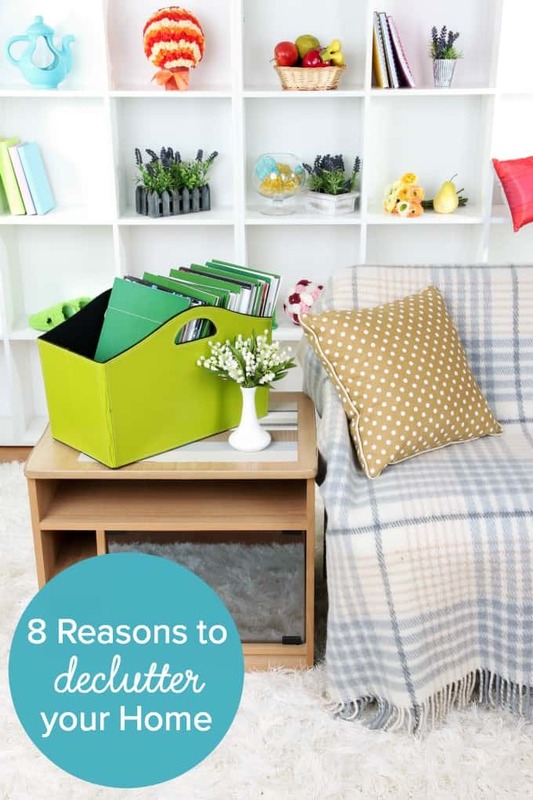 Here are eight reasons to declutter your home and how it can benefit you and your family. 1. Creates space. Obviously, if you have less stuff in the way, you’ll have more room to move around and your home will appear larger. It also means you have more space for new things to enjoy. 2. Clears stress. Clutter = stress. When you get rid of unnecessary items, it also lifts that stress and improves your focus. 3. Tackle tasks with ease. If you’re constantly maneuvering around stuff, it makes getting any job, cleaning or otherwise, more difficult to complete. 4. Improves time management. One of the immediate benefits of decluttering is that you’ll be wasting less time. It’s so much faster to find items in a clean and organized home. You won’t spend hours looking for that elusive item that is hidden amongst the mess! 5. Cleaning is way easier. You won’t have dust as much since you’ll own less things or move items around so you can vacuum or sweep under them. Before decluttering, it would take me forever to clean my house. Now, I can tidy it up in as little as 15 minutes. 6. Lessens the dust. With more stuff comes more dust. You’ll enjoy less dust in the air which improves breathing and makes your own smell clean and fresh. 7. Prepared for guests. I used to be mortified if someone were to show up at my home and see the messy state it was in. It was stressful and embarrassing for me. I haven’t felt that way in years which is huge for me. If someone comes over now, I know my home is, more or less, ready for guests. 8. Earn money. If you are ready to part ways with any valuables, consider selling the item locally! List it on Kijiji or VarageSale to earn a few extra $$$. Decluttering is good for the mind, body and soul. It feels so good to get rid of unwanted items that are holding you back from enjoying your home to its fullest potential. I usually declutter a few times a year for all the reasons above. The process can be difficult, but it’s worth it in the end. For more organizing posts, check out 5 Pantry Organization Tips to Save Your Sanity, How to Organize Paper Clutter in Your Home and 22 Easy Way to Organize Your Bathroom. How do you feel about clutter? I agree with the easing stress part !!!! A Cluttered space can definitely be overwhelming. I hate clutter. I can’t handle it. Growing up in my parents house that was always neat and tidy – no clutter, everything had a place – made me this way. When I moved in with my (now husband) into his home (he lived with his grandparents and an uncle), they had clutter, clutter, clutter. and I hated it. When we moved into our own place I told him we were throwing away things we didn’t need and that didn’t have a place. We’ve gotten so much better at simplicity now and we actually prefer it. If it doesn’t have a place, it doesn’t come through the door. I can’t stand clutter, my house is neat and tidy most of the time! Everything as a place. That also mean I’m constantly picking up. I learn to relax a little, got tire of nagging. I am in the (very slow) process of decluttering and it is great! Even better though, now that the toys have an easily accessible home my daughter is starting to help clean up too. Now if I could just get a dollar for every time I’d sung the clean-up song from Daniel Tiger we’d be in business. I do not like clutter and am forever going through things and getting rid of things. Hubby is bad for keeping stuff he doesn’t need or use so every chance I get I get rid of it. He never misses it. I do not like clutter because it is difficult to find items sometimes, It can be embarrassing to have unexpected company come and you feel your house is messy.I think I am getting better about decluttering and I feel good about it.